Home » General Health » What Causes Excessive Gas in the Stomach? What causes excessive gas is largely the air we take in when eating and drinking, but air can also be swallowed by chewing tobacco, from hyperventilating, and from loose dentures.There are many ways you can manage excessive gas, and among them are also homeopathic remedies for flatulence that can help with the discomfort. Eating foods that are high in fiber such as cabbage, beans and apples, and drinking carbonated beverages such as soda can also cause excess gas. Being lactose intolerant is another cause of bloating and gas. Passing gas is a normal bodily function. It happens every day, and multiple times a day at that, at least 10 to 12 times; even up to 23 times a day is considered normal. It may not be socially acceptable behavior, but it’s still a perfectly natural one. When it comes to food, what causes excessive gas? Food and drink are the most common reasons for causes of excessive gas formation in the stomach. Below are some foods that can cause stomach trouble. An inability to break down certain sugar compounds in the digestive tract can lead to those sugars sitting in the intestines, which then begin fermenting and causing gas. If gas is an issue, cut back on consuming products with added sugar, such as chocolate bars, cookies, cakes, sodas, and hard candies. Indulge cravings with natural sugars such as honey or maple syrup. Imbalances in gut flora can cause flatulence. 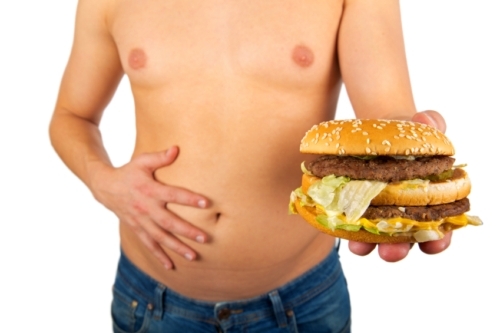 Our stomachs have both good and bad bacteria that enter through food and water. If they’re not kept in check, the bad bacteria can multiply and grow, causing imbalance issues in the gut. This imbalance leads to bloating, cramps, and bad gas. Eating foods that encourage the growth of good bacteria is essential to preventing this from happening. Traditional fermented foods such as yogurt, kefir, cottage cheese, sauerkraut, pickles, and miso are excellent choices. Cruciferous vegetables such as broccoli, cauliflower, and cabbage are some of the worst offenders, but only if your body isn’t accustomed to eating them. While they do produce more gas in the stomach, if they’re eaten regularly enough, the body will adapt to that level of gas production. Other foods that cause gas are prunes, Brussels sprouts, onions, lentils and raisins. Does dairy cause gas? The simple answer is yes, so if you have gas and bloating try eliminating dairy products for two weeks and see if the symptoms back off. When it comes to health conditions, what causes excessive gas? Some health conditions can cause excessive gas in the stomach. Talk to your doctor to see if one of the concerns below might apply to you. Celiac disease, which, by the way, is the only real form of gluten intolerance there is, can cause excessive gassiness. People with the disease need to follow a strict diet, so talk to your doctor if you feel you might have it. Irritable bowel syndrome (IBS) affects many people and is associated with gas, bloating, constipation, and diarrhea. Indigestion, which can take the form of either dyspepsia (pain felt in the upper abdomen) or heartburn (a burning pain felt behind the breastbone) can also lead to excessive gas. Gastroenteritis is commonly, but incorrectly, often referred to as the stomach flu, but it’s really a stomach and bowel infection, and it can cause a lot of gas. Another cause of bad gas is giardiasis, an infection caused by tiny parasites that take over the digestive system. So, to recap, what causes excessive gas? Excessive gas can be a problem, and an embarrassing one at that, especially in public. We are all very self-conscious about this basic human function. If you’ve tried, for example, eliminating dairy, eating more mindfully, or avoiding carbonated beverages, and you aren’t suffering from a health condition that is known to cause gas, then perhaps it’s time to visit your doctor to discuss the situation and see what they say. Sometimes all it takes to solve the problem are simple and easy alterations in diet and lifestyle. Medications can also cause flatulence, but talk to your doctor before stopping any medications—you don’t want to experience any unforeseen consequences as a result just because you want to avoid feeling gassy. “Excessive Gas (Flatulence),” About Kids Health web site; http://www.aboutkidshealth.ca/en/healthaz/conditionsanddiseases/digestivesystemdisorders/pages/excessive-gas-flatulence.aspx, last accessed March 9, 2016. “What Causes Bloating and Excessive Gas?” Dr. David Williams web site; http://www.drdavidwilliams.com/what-causes-bloating-excessive-gas/, last accessed March 9, 2016. “Flatulence (Gas),” eMedicine Health web site; http://www.emedicinehealth.com/flatulence_gas/page3_em.htm#flatulence_gas_causes, last accessed March 9, 2016. “Excessive Gas and the Foods You Eat,” Everyday Health web site; http://www.everydayhealth.com/digestive-health-pictures/7-top-gas-producing-foods.aspx, last accessed March 9, 2016. “Flatulence-Causes,” NHS Choices web site; http://www.nhs.uk/Conditions/Flatulence/Pages/Causes.aspx, last accessed March 9, 2016. “The Top 10 Stomach Gas Causes You Would Not Expect,” Stomach Bloating web site; http://stomachbloating.net/stomach-gas-causes-you-would-not-expect/, last accessed March 9, 2016. “The Causes of Excessive Gas,” Everyday Health web site; http://www.everydayhealth.com/excessive-gas/excessive-gas-tips.aspx, last accessed March 9, 2016.